Something was wrong: The plants weren’t dead. After letting the field in eastern Oregon lay fallow for a season, the farmer sprayed the popular herbicide glyphosate to kill weeds and errant plants to make way for the coming season. Most of the plants withered and died, as expected, but scattered around there stood unscathed green stalks of wheat. There are plants that glyphosate can’t kill, ones grown from seeds with genes deliberately modified to resist the chemical’s effects. Glyphosate-resistant corn, soybeans, cotton, alfalfa, sugar beets and canola are grown from seeds developed and sold by agriculture giant Monsanto, which also sells the herbicide under the brand name Roundup. It appeared this particular wheat was herbicide-resistant. Which wasn’t supposed to be possible: Monsanto doesn’t sell genetically modified wheat, and there’s none grown commercially anywhere in the world. On the final day of April, the farmer sent the surviving plants to Carol Mallory-Smith, a weed expert at Oregon State University. The initial test results were surprising, so she did a more precise molecular test. Notification went out to the state Department of Agriculture, the Oregon Wheat Commission and the U.S. Department of Agriculture, which did its own testing for almost a month before making the announcement on May 29: A strain of genetically modified wheat developed years earlier by Monsanto — but never approved by the federal government — had been found in the Oregon wheat field. The discovery made headlines around the globe, while sending chills through international markets. Japan and other Asian countries halted their purchases and began testing all grain straight off incoming ships. Treating it as a criminal probe, investigators under the USDA interviewed more than 250 local growers and tested grain. Monsanto did its own tests. Washington State University tested the wheat grown in its breeding programs and then almost all varieties grown in the Northwest. No other trace of suspect wheat was found, and Asian countries agreed to resume buying Oregon’s wheat after several tense months. But the federal government’s investigation remains open, because inspectors have yet to answer the central question: How did this happen? It’s still a topic of coffee-shop speculation among the growers in Oregon, even as they prepare their fields for planting next year’s crop. It’s possible seeds got mixed up somewhere. One theory blames a flock of passing geese. Monsanto suggested it could be sabotage. One basic underlying question barely came up at all: Should we be afraid of genetically modified food? The scientific consensus among the world’s major health organizations is that genetically modified food — commonly known as genetically modified organisms, or GMOs — is not harmful to human health. But it’s impossible to prove a negative, and an unavoidable gap exists between what science shows and what can’t possibly be known about the future. A growing number of Americans are eyeing that divide with mistrust. Farmers have been selectively breeding and controlling the genetic traits of crops and livestock for centuries, but genetic engineering dates back to the ’70s and ’80s, when a growing understanding of DNA made it possible to selectively transfer genes from one organism to another. Pioneers in the field envisioned cures for diseases and crops that wouldn’t freeze. But public uneasiness with genetically modified organisms and the companies that produce them was already apparent by 1992, when a Boston College professor coined the term “Frankenfood” in a letter to the New York Times. By the end of the ’90s, most countries in Europe had limited GMOs or banned them outright. Supporters of genetic engineering believe the technology has the potential to save crops from disease or feed the world’s growing population. They point to Golden Rice, one serving of which could provide half of a child’s daily Vitamin A nutrition. Opponents consider it unnecessary and unnatural, while lining the pockets of massive corporations unconcerned with effects on human health. The debate is primarily waged in the arenas of business and politics, and the latest round takes place in Washington state this fall as voters consider Initiative 522. If passed, the state would become the first to require the labeling of foods made with genetically modified ingredients. Right now, the only genetically engineered produce a consumer might find in grocery store aisles are papayas — genetically modified in the late ’90s to resist a devastating virus — and sweet corn, a variety of which was approved last year. But 90 percent of the nation’s corn, cotton and soybeans are genetically modified, along with other crops like canola and sugar beets, and it’s estimated that at least 70 percent of processed foods contain genetically modified ingredients. Supporters of GMO technology point to this as evidence that Americans have been eating GMOs for decades without incident. Opponents see arrogant corporations attempting to feed people GMOs without their knowledge. At the Moran Prairie Library on a soggy Saturday night, Howard Vlieger speaks to a captive audience. Billed as a third-generation Iowa farmer, crop nutrition advisor and GMO expert, he looks like a cowboy in his collared shirt and bolo tie, but talks with the authority of a tenured professor in his casual, gritty cadence. Name-dropping scientists he’s worked with, studies he’s read, technical nomenclature, anecdotes and data, he shifts his weight, sways and gesticulates like a preacher. You can almost hear the Iowa sweet corn rustling in the wind. He clicks his PowerPoint remote with one hand while the other underscores his augury. He’s talking about Monsanto’s extremely popular, glyphosate-based herbicide Roundup, sold to farmers planting herbicide-resistant, genetically engineered crops. He cites a 2012 WSU study that shows how heavy reliance on Roundup begot the emergence and spread of herbicide-resistant superweeds. A woman in the front row with a long, blonde ponytail, taking notes and chewing gum, raises her hand. “Why would I as a mother want to feed my family food that’s been sprayed with this amount of poison?” she asks. “That’s an excellent question,” Vlieger says. Before his two-hour-long presentation is up, Vlieger flips through graphs charting trend lines in autism diagnoses, diabetes, obesity and thyroid cancer that mirror rising rates of glyphosate use. One slide reads “What is Causing the Birth Defects to Babies in the Yakima Valley” with a screenshot of a related ABC News article below. Another shows the infant mortality rate in the United States — more than twice that of Sweden and Japan. Labeling has emerged as the latest battlefront pitting skeptical consumers against Big Agribusiness. While grassroots advocates of I-522 were convening in libraries, writing letters to the editor and cajoling support from local businesses and politicians, opposition to GMO labeling was building its war chest. After a quiet summer from the No on 522 campaign, biotech giants Monsanto and DuPont Pioneer wrote checks for more than $4.5 million and $3.2 million, respectively, in early September. So far, the anti-labeling campaign has outraised initiative supporters more than 2-to-1, with $11 million in its coffers and less than 15 percent of its war chest spent. The campaign is backed by two other corporations — Bayer CropScience and Dow AgroSciences — in addition to the Grocery Manufacturers Association, a trade group that represents food industry stalwarts like Kraft, Coca-Cola and Starbucks. The anti-labeling side also counts the state’s most prominent agricultural groups among its supporters, including the Washington State Farm Bureau, Washington Association of Wheat Growers, Washington State Dairy Federation and Washington Cattlemen’s Association. Although the pro-labeling side benefits from an active network of grassroots volunteers, they’re outmatched financially, and money can decide elections. Consider the case in California. Last November, voters rejected Proposition 37, a GMO-labeling ballot measure, 51 percent to 49 percent — despite the fact that voter approval for Prop. 37 was consistently ahead in the polls. “Forty-five million dollars of deceptive and misleading information raining on the heads of California voters almost every minute of the day at some point,” says Stacy Malkan, the former media director for Yes on Prop. 37. The No on 37 campaign outspent its opponents 5-to-1 on an advertising blitz that Malkan says successfully confused voters. This is the strategy initiative opponents will typically take, says Travis Ridout, a WSU political science professor. “Sometimes the default position for people — if they don’t understand something, if they’re confused by the initiative — is to vote ‘no.’ Then the status quo isn’t upset,” Ridout says. So far, though, public opinion seems to side with labeling backers. A June poll paid for by Yes on 522 found that 66 percent of likely voters would support a labeling law, compared to just 22 percent who wouldn’t. Backers of I-522 collected more than 350,000 signatures, the second highest number of signatures gathered for a state initiative in Washington history. Yes of 522 spokeswoman Elizabeth Larter is quick to point out her campaign has raised $3.6 million from more than 7,000 donors, 80 percent of whom are from Washington state. The I-522 campaign is also backed by big business interests. Dr. Bronner’s Magic Soaps has contributed $950,000 to the campaign; Mercola.com, $200,000; and Nature’s Path foods, $150,000. Popular organic brands like Annie’s Homegrown, Clif Bar, Amy’s Kitchen and Stonyfield Farm have each donated $20,000 or more. Still, I-522 opponents say a GMO label is nothing short of a warning sticker. In January, Chris McManus, a vegan and owner of a small advertising agency in Tacoma, delivered signatures in support of I-522 to the state elections office in an ambulance. It was a creative, albeit confusing, gesture from the author of I-522, as labeling proponents have long insisted they aren’t taking an adversarial position on genetically modified foods. Their TV ads and campaign literature stress a central message: the importance of consumers’ right to know what they’re eating. On a four-and-a-half-acre field of tawny, prickly stubble near Valleyford, Wash., Hal Meenach dumps a handful of black and burgundy canola seeds in his mouth. “Here’s that nasty GM canola,” he says with a grin. In its seed form, canola tastes hot, like a radish; its leaves taste like kale, but less bitter. Meenach and his wife, Robyn, both 61 and suntanned, run a small farm off Palouse Highway, where Hal was raised. Here, they grow conventional barley and triticale, a rye and wheat hybrid, and genetically modified canola. The canola seeds are mostly squeezed into oil for use in cooking. The seed meal is then converted into livestock feed. They’ve exported their canola to Japan and Canada and sold it to a wild bird seed manufacturer in Montana and dairy farms in-state. The Meenachs use Roundup Ready canola, engineered to tolerate the herbicide, for one big reason: weed control. In the spring, wild oats, dog fennel and catchweed bedstraw can choke the sunlight from conventional canola crops. Hal had to use pricey and toxic chemicals to control them. Since he switched to modified spring canola 15 years ago, he saves more money using Roundup, which is cheaper than the herbicides he used in the past and safer for him to apply. Monsanto’s seed is at least 10 times more expensive than conventional varieties, but Meenach estimates he’s saving about $18 an acre in herbicide costs. His first spring canola crops averaged about 400 pounds of seed per acre. Now he’s currently averaging 1,200 pounds. Unsurprisingly, the Meenachs don’t support I-522. They have nothing against food transparency or non-GMO crops; in fact, for the first time in five years, they planted a small plot of conventional canola after a barley variety failed to yield this spring. But they worry about the additional level of bureaucracy the measure would create. They don’t understand why the state Department of Health, rather than the state Department of Agriculture, would enforce the new rules. They say labeling will require more recordkeeping and more time spent cleaning machinery, trucks and bins and segregating products on their part. Most of all, they worry about what other I-522 opponents have assailed as the “zero tolerance clause” of the initiative: Producers of processed foods containing trace amounts of genetically engineered materials would be exempt from civil penalties, but that expires in July 2019. “Year to year, crop to crop, you cannot clean every seed out of every crevice, and that’s what ‘zero tolerance’ means. Zero! We cannot achieve that,” Robyn says. “They don’t understand how crops are produced. Matt and Kim Davidson want people to feel connected to their food just as they did when they were kids growing up on a farm in northern Minnesota. For them, labeling is a simple matter of transparency. That’s why they’ve endorsed I-522. “We’ve always believed that everyone has a right to know who grows their food and how it’s grown,” says Kim, 47. The siblings run Davidson Commodities, a Spokane-based commodities supplier that markets locally produced mustard seeds, lentils, garbanzo beans and green split peas to retailers nationwide. 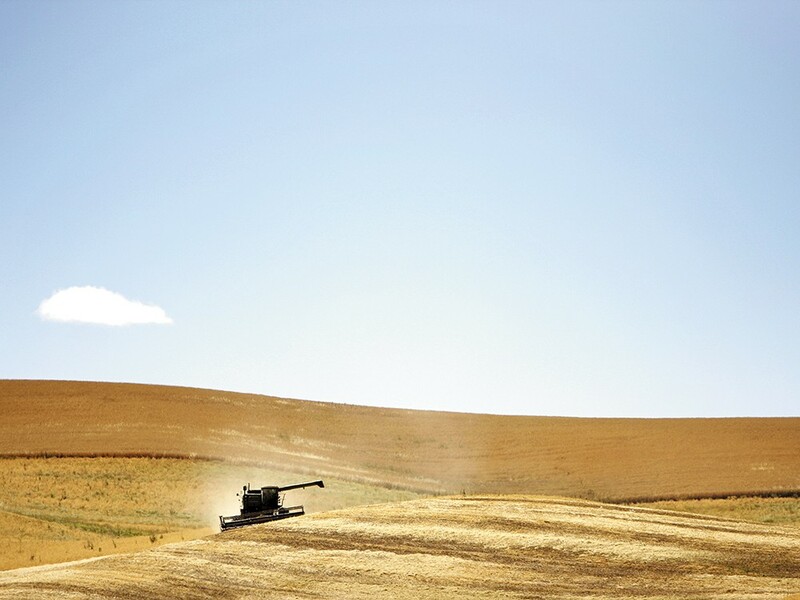 Their goods are grown by a cooperative of sustainable farmers on the Palouse in what they say is one of the last GMO-free havens in Washington state. Their own brands, in fact, are labeled and verified by the Non-GMO Project, a third-party service that audits non-GMO food producers who want the legitimacy of the Project’s bold, square logo stamped on their packaging. The Davidsons say they’ve been able to verify their products with no additional cost to their consumers. In fact, Matt says the Non-GMO Project label “has been crucial” to their ability to market their goods to 200 retailers nationwide. “This little logo has allowed a small business like ours to compete with much larger interests in the marketplace,” he says. The Davidsons have heard all the arguments offered by labeling opponents. Based on their own experience, they say labeling wouldn’t burden producers with extra costs. They don’t think labels will convince shoppers to be wary of genetically modified food, either. Matt holds up a can of Mountain Dew. “Look how much sugar is in here. This is a lot of sugar. This is 15 percent of my daily value of sugar. But that’s not stopping me from drinking it at 9 o’clock in the morning. Somewhere in Washington state, a grove of trees bear apples that don’t turn brown once cut open. Someone driving by would never notice a difference between these and any other apple orchard — and no one would drive by, because these trees are isolated far from roads and other fruit trees. These are Arctic apples, and once given final approval, they will likely become the first genetically modified apples on the market. None of the high-minded justifications for GMOs hold true for the Arctic apple: It does not have the potential to save a disease-threatened crop, or the ability to pass on nutrients to children. But neither is it engineered to tolerate pesticides or benefit the producer in ways that remain invisible to the consumer. This is simply an apple for people who like to eat apples, in the hopes that they’ll eat more of them and waste less. Okanagan Specialty Fruits founder Neal Carter won’t reveal where the trees are growing in Washington for fear of sabotage, but he’s eager to explain everything else about the Arctic apple. Standing on the porch overlooking his orchard in Summerland, British Columbia, a five-hour drive northwest from Spokane, he takes a break from the harvest to talk about how he saw the potential of biotechnology while working around the world on crops ranging from potatoes to date palms and mangos. Carter is used to assuring people: They are a small company, not Monsanto. They are not Roundup Ready. They are not putting pesticides into apples or bacteria or anything else. The apples’ genes are modified to suppress the trait that causes enzymatic browning. The company uses the example of a transcontinental railway — they swapped out a short length of track with a different piece of track. The way he sees it, genetic modification isn’t the sole answer to the world’s food problems, but it’s an important tool. Sometimes the right one, sometimes not. Carter speaks with an even tone even when recounting the hostile comments routinely directed at the company. Carter says the industry so far has done “just a really bad job” communicating with consumers. The company actively engages with angry commenters on Facebook with a firm, cheerful tone, and invites critics to look at the trove of documentation posted online. Despite the hostility, Carter is confident that consumers can and want to understand the science. He trusts that people who look into it sincerely will come to believe the assurances he’s repeated many times. 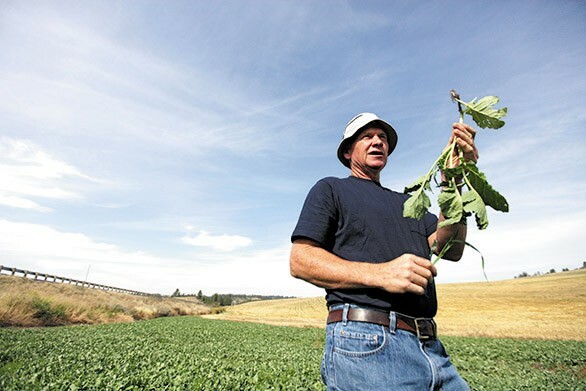 In August, as relieved Northwest wheat farmers finished up harvest, a Central Washington alfalfa grower had his crop rejected for export because of the presence of a genetically modified trait. Roundup Ready alfalfa is widely grown in Washington, so the report didn’t draw the same amount of concern as the glyphosate-resistant wheat found in eastern Oregon. The Washington State Department of Agriculture called the contamination “within ranges acceptable to much of the marketplace,” and the USDA declined to investigate. The story faded from headlines after a few days, but it underscored the difficulty of keeping genetically modified crops separate from those that aren’t. Months after the Oregon wheat was found, growers and local experts look back with some bewilderment that the discovery received so much attention, considering the gene in question is already present in millions of acres of corn, soybeans and other crops. Jim Moyer, who coordinated the testing at WSU as director of the school’s Agricultural Research Center, grew up on a wheat farm outside Dayton and spent most of his career at North Carolina State before returning to the Northwest. He looks back on why, decades after the technology was introduced, genetically modified crops continue to cause such alarm. Moyer hopes they won’t have to deal with the particular issue of unexpected genetically modified wheat again, but expects similar problems to come up as long as GMOs remain so controversial. GMOs are produced from plants, animals and microbes that have had their genetic code altered by introducing a specific piece of foreign DNA into a single cell of an organism. In genetically engineered crops, for example, scientists use a “cut-and-splice” method of transferring DNA from the same or different species. The goal is to confer crops — quickly and more precisely than conventional breeding techniques — with desirable traits, like pest protection, herbicide resistance and better nutritional quality. “When we have a genetically engineered plant, what’s been done was adding a single gene to code for a single protein that’s beneficial to that plant,” explains R. James Cook, a plant pathologist and former dean of Washington State University’s College of Agricultural, Human and Natural Resource Sciences. In laboratory settings, genes are inserted into plants via two main procedures: Using Agrobacterium tumefaciens, a soil bacterium that has the ability to inject “plasmids”— small, circular pieces of genetic material — into plant DNA, or shooting plant cells with a gene gun. In the first method, researchers replace the bacterial plasmids with desired genes. In the second, scientists shoot tiny metal pellets coated with genetic material into a plant cell, where those genes are then transported to the cell’s nucleus. To be certified as organic by the USDA, a product must not contain genetically modified organisms. Because of this, buying certified organic products is currently one way for consumers to avoid GMOs. Groups in favor of organic farming, such as the Organic Consumers Fund, are top donors to the Yes on I-522 campaign in favor of labeling. Many advocates of organic farming see genetic modification as incompatible with the philosophy of working with nature. This year, the case of a farmer sued by Monsanto reached the Supreme Court, which ruled 9-0 in favor of Monsanto because patents would “plummet in value” if people could purchase a product once and then make their own copies. Monsanto’s size and influence makes it a top target for people against GMOs — especially since it donates millions to fight labeling initiatives — but it’s dwarfed by Walmart, Apple and big oil companies, and ranked No. 206 on the latest Fortune 500 list of largest American corporations. The federal government investigated Monsanto for antitrust violations but dropped the investigation without comment late last year. Environmental questions have always been a problem for genetically modified crops: Public outcry against GMOs in the late ’90s followed the report — later proved wrong — that Bt corn, engineered to resist pests without applying insecticide, was killing monarch butterfly caterpillars. More recently, Charles Benbrook, a Washington State University researcher and longtime critic of GMOs, found that insecticide use decreased between 1996 and 2011, but herbicide use increased per acre. The conclusion wasn’t surprising: A farmer who grows crops genetically engineered to resist herbicide can spray that herbicide more freely. A related problem is “superweeds” that have developed resistance to standard herbicides, especially in the Midwest. But those problems result from the way genetically modified crops have been designed, not from the technology itself. More broadly, there are concerns about predicting how a genetically engineered plant will interact in the environment, since genes in some plants can be passed around through cross-pollination and other methods. Oregon State University weed expert Carol Mallory-Smith, who identified the genetically modified wheat found in Oregon this year, sees benefits in genetic modification but worries that oversight is extremely difficult. “Once you put a gene in the environment, it doesn’t just stay in the field where you put it,” she says. In the U.S., genetically modified organisms are regulated by three agencies — the Food and Drug Administration, the U.S. Department of Agriculture and the Environmental Protection Agency — to check for effects on the environment and human and animal health. The goal is to determine whether the genetically modified product is equivalent to its conventional version. Because companies submit their own documentation of safety for government approval, critics say this amounts to “rubber stamp” approval with no testing at all. Beyond that, some people against GMOs don’t trust the government to regulate impartially because of close ties with the biotech industry — some groups keep lists of people who have worked for both the government and industry giant Monsanto. Last year, a Harvard Business School professor investigating GMO approval found that regulatory agencies like the USDA are insulated from direct lobbying from the companies that make the products, but influenced by third-party groups like growers associations. Which officials from Eastern Washington have endorsed I-522? ... and who is opposed to I-522?